HANG TEN x Azta Urban Salon: Win a Makeover Promo! Ang bilis lang ng January! At dahil tayo ang social media generation, lahat nagbabatian na ng happy love month ( :p) ....ngayon palang! Anyway, para hindi naman ako Vday scrooge, I am pleased to announce a cool contest / online promo where you can win P10, 000 worth of MAKEOVER for you loved one! 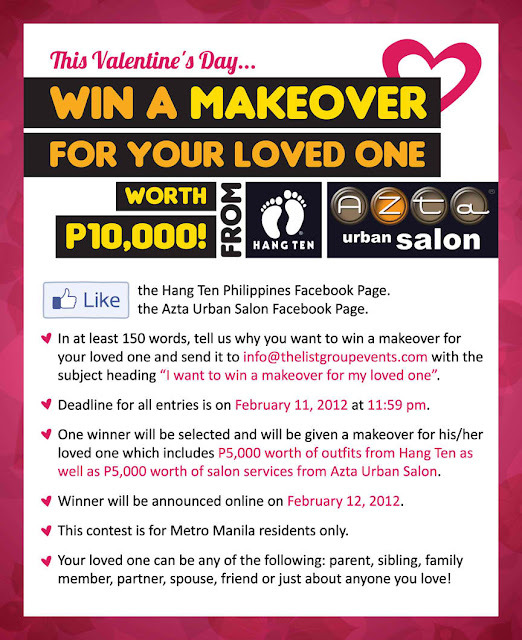 Hang Ten and Azta Urban Salon will make your Valentines Day extra special with P10,000 worth of MAKEOVER! Read on poster below for the deets. Make the love of your life happy! :) Good luck! Note: LOVED ONE (n) parent, sibling, family member, partner, spouse, friend, or just about anyone you love! Maganda yang definition nila ng Loved One. Para nagkakalinawan tayo, lol. Hiya very nice blog!! Man .. Excellent .. Superb .. I'll bookmark your web site and take the feeds additionally?I'm satisfied to find numerous helpful information right here within the submit, we need develop extra strategies on this regard, thanks for sharing. . . . . .